“In music the passions enjoy themselves” says Nietzsche. “If music be the food of love, play on!” says Shakespeare. If food is your passion and sheer enjoyment your pleasure, play at Overture, says I. Yes, I have been quite utterly charmed by the overtures of Overture, the epicurean jewel in the crown of Hidden Valley wine estate in Stellenbosch. An Eat Out Top 10 restaurant, we dined there recently with some friends from abroad, and what a culinary tour-de-force we enjoyed. We arrived at Overture on a hot Saturday afternoon, our appetites whetted by a pleasant morning of wine tasting at the gorgeous Stellenbosch estates. Happily ensconced at the prime table, we took a minute to appreciate our breathtaking surroundings. Overture is best enjoyed on a fine day – the view is quite spectacular. A baking landscape pock-marked with irrigated blocks of vines, destined to become the Hidden Valley wines. The overhead sprays hissed gentle wafts of cold mist, and some ice cold mineral water a l’estate was welcome and refreshing. There is not much ‘interior’ to speak of, with tables placed in an outdoor, covered courtyard. Décor and table settings are simple and unassuming, clean and crisp. It’s feels as if one has walked into an oasis. Our enthusiastic host and conductor for the day was ushered onto stage by an ice cold bottle of MCC, with which we drank to health, happiness and the menu. There are several menu options at Overture, and these change regularly. We all decided to indulge in the eight course tasting menu with wine pairings. Our first course was salted yellowtail with watermelon, garlic emulsion and watermelon pickle. This was a dainty plate of food, with the pickled watermelon skin a particularly original touch. The dish was paired with a 2012 Hidden Valley Sauvignon Blanc. Bold, salted flavours proved a perfect ‘overture’ for the symphony to follow. The next starter course was sweet onion tart with smoked feta, Huguenot cheese, rocket, walnuts and beetroot. This dish was absolutely wonderful, beautiful flavours and textures, buttery pastry and a delightful treat for the taste buds. It was paired with Hidden Valley Chenin Blanc 2012 – floral and sweet elements striking a harmonious chord with the food. 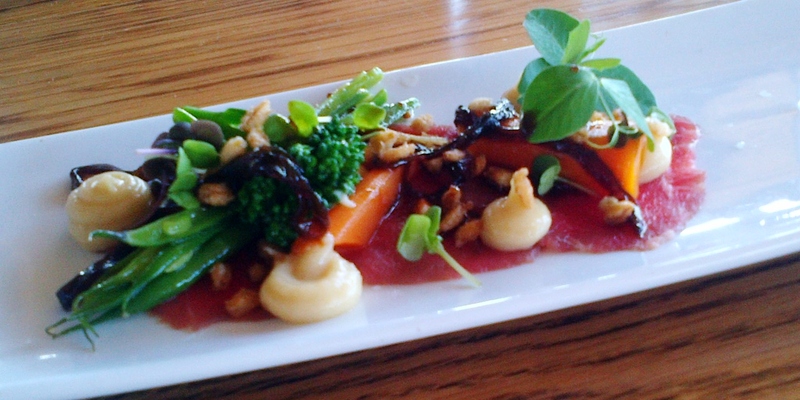 Our third starter dish was beef carpaccio with balsamic onion, pickled vegetables and puffed barley. It was quite an exceptional creation, rather like a small reproduction of the Sunday roast one’s mother used to make – tasting just like home, but served cold and skilfully presented. It was sensational and well paired with the Pepin Conde Pinot Noir 2011. There followed two intermediate courses. 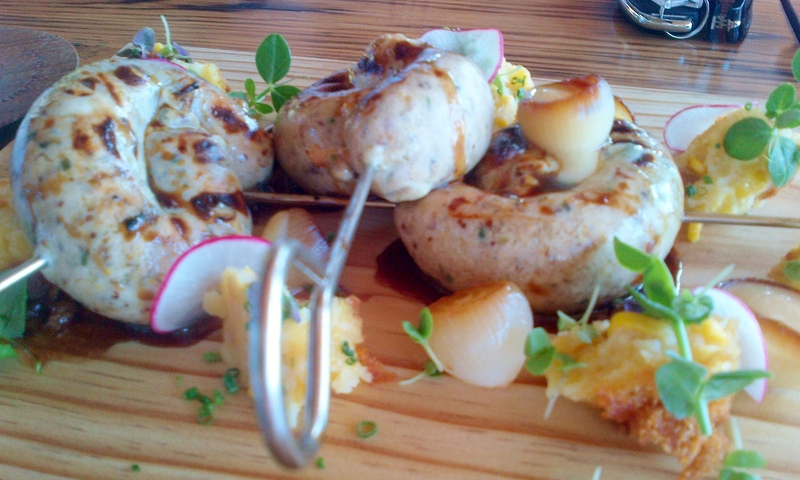 The first of these was vine-grilled, homemade pork sausage with mielie tart, sweet mustard and cabbage slaw. In my experience of tasting menus, this dish is extraordinary and unprecedented. The components were presented on large wooden blocks, and we helped ourselves. It was a marvel, flavoursome, generous, I barely know where to start. The pork sausages were pleasingly spiced, the slaw served to provide a cold contrast and the mielie tart added a South African twist. It was paired with Hidden Valley Pinotage 2011, the spiciness of wine and food in perfect balance. 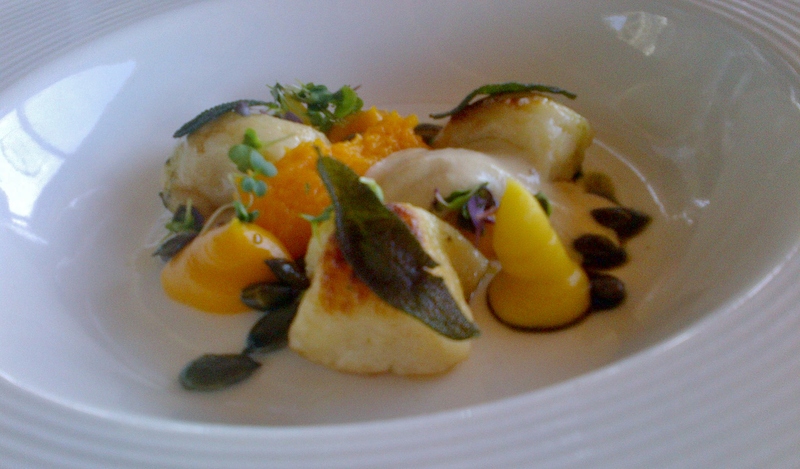 There followed gnocchi with pumpkin puree, pumpkin seed and parmesan cream – served with The Foundry Roussanne 2012. Another excellent dish, gnocchi light, pumpkin flavoursome but not too sweet. The first main dish we enjoyed was roast hake with pomme puree, courgette, gremolata and sauce vierge. Sauce of the virgin. Not an amusing play on words, but a legitimate combination of oils, freshest herbs, lemon and tomatoes. The fish was beautifully cooked, aromatic and the sauce added a little touch of magic. Light and refreshing, and cleverly paired with Mimosa Chardonnay 2011. The main movement of the masterpiece was confit duck leg, mushroom risotto, brussel sprouts and celeriac puree. This was paired with the Hidden Valley ‘Sectets’ blend. The pairing was excellent and it was yet another superb dish. It was then time for the grande finale – it was going to have to be something outstanding as the bar had been set so high. And it was. For pudding we had a vanilla and hazelnut praline soufflé with Tonka bean ice-cream. 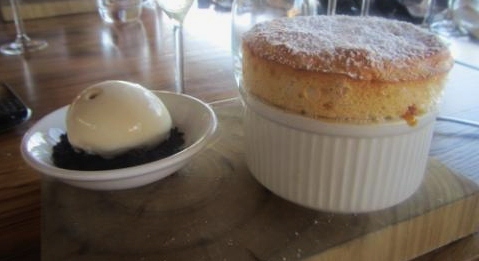 Eating this soufflé was a joy – it looked so appetising, and there was something heavenly about the lightness and balance of flavours. As for the ice-cream, it was a first for me. Tonka beans are the seeds from the Kumaru tree, which is native to Central and South America. They are small, wrinkled little chaps, but they have aromas reminiscent of vanilla, cinnamon and clove. The Graham Beck Rhona Muscadel 2011 was a lovely accompaniment to this pudding. The service at Overture was everything one would expect. Waiters were all good natured, obliging and engaging. There were no timing issues in terms of wine arriving after the food – something that seems to happen in even the very best restaurants. Furthermore, we were delighted by the generosity. We were given large tasting portions of wine, which made for a festive occasion. As at the end of a perfect symphony, we left feeling uplifted and satisfied. This is some of the most immaculate, creative and interesting food I have had the pleasure of eating in South Africa. From the curtain raiser, to the crescendo and then the final movement, it was exquisite. Standing ovation, says I. 5 tasting menus with wine pairing, 1 bottle MCC, water, a few glasses of other wine and coffee came to R 5250.00 including tip. The review was sent to the restaurant on February 26th 2013.